Jonathan Newell talks to Microwave Vision Group (MVG) about its latest equipment for EMC testing specialists. Earlier this year, MVG released its 18-40GHz Dual-Ridge Horn Antenna, adding to its range of specialist equipment aimed at test houses performing EMC test services. The dual-ridge horn adds to the company’s existing range of antennas for emission and absorption testing and takes ease of test set-up a stage further by toughening up its construction and reducing weight. The EH1840 antenna is a single, linearly polarised antenna that combines stable gain performance, low VSWR, and excellent cross-polar discrimination with wide band frequency operation. I spoke to Donald Gray, Director of EMC business development at MVG, and asked him what this means for EMC test engineers. “The antenna has a very wide frequency range and has very stable gain performance throughout that range,” he told me. Grey went on to say that there is a general increase in the requirements for performing EMC testing in the 18-40GHz range and that the new Dual-Ridge Horn antenna provides engineers with a product that is designed for that range and which offers the durability needed to cope with a test house environment. “Antennas are set up for one test, then taken down and re-positioned for another test so there is a lot of repetitive handling,” Gray explained. The tough, lightweight materials using in the antenna’s construction make it easy to handle and capable of withstanding a lot of handling in test laboratory environments. In addition, the antenna is equipped with a high precision female K connector which offers superior reliability and durability. According to Gray, such connectors are a stable design and are not prone to such annoyances as working loose. 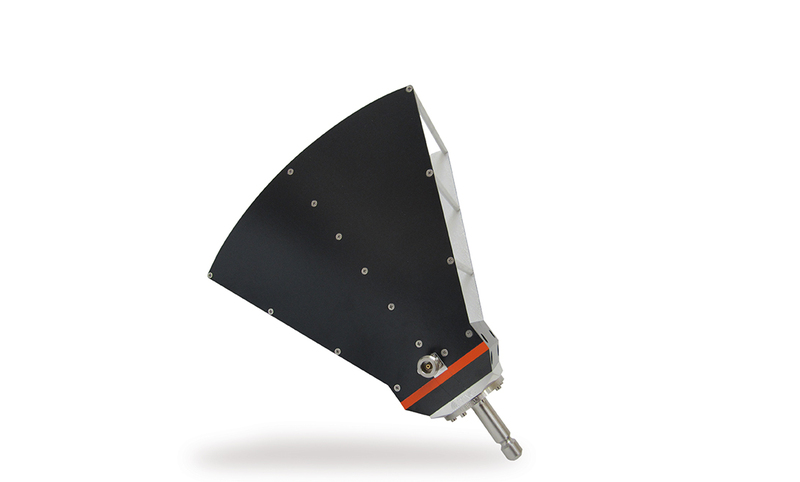 The Dual-Horn Antenna is designed for the very precise measurement of radiated emissions. “The antenna reduces the generation of higher order modes and reduces VSWR to produce a very smooth curve over the entire frequency range,” says Gray. VSWR (Voltage Standing Wave Ratio) is a parameter that relates to the amount of power that’s reflected back from the antenna. Reflected power creates standing waves, hence the ratio being used as a measure. The lower the VSWR, the less power is reflected and therefore the better the antenna. MVG’s product also has the advantage of having good cross-polar discrimination, meaning that the polarization of any signal received by the antenna is maintained rather than introducing any ellipticity to the signal. Such factors as VSWR, XPD and stable gain performance not only improve the accuracy of the measurements, but also make setting up and characterising the antenna easier for the engineer. “Having very smooth antenna factors make it very easy for correction,” says Gray. Calibrated at a distance of 1 metre in line with SAE ARP 958, the Dual-Ridge Antenna horn is applicable for testing against such standards as FCC and MIL-STD-461, the military standard for testing equipment for Electromagnetic Compatibility. Gray explained that it’s also conducive to other applications such as RF connectivity. It’s possible for it to be used for absorption testing at low levels but this isn’t its intended design application and is ideally suited to measuring radiated emissions. Earlier this year, MVG also announced its involvement in the development of 5G testing. With very high frequency transmissions in the mmWave range, antennas will need to be ultra-precise and MVG is employing its antenna expertise in the development of 5G testing and Over-The-Air (OTA) measurements. Highly active in this field, MVG had been involved in a number of events globally this year with the latest being the “5G Antenna Test & Measurement” seminar at the Mobile World Congress event in San Francisco in September.